Got a spring or fall adventure in the works? Whether you’re planning to tackle some of the best hiking trails in Europe, Asia or The Americas, you’ll likely run into some inclement weather. And that’s precisely where a trusty pair of the best waterproof hiking shoes for men will become your new best friend! Unlike run-of-the-mill sneakers or walking shoes, waterproof hiking shoes are built for the toughest of conditions. They feature durable uppers lined with breathable weatherproof membranes like Gore-Tex to keep your feet dry, and sturdy outsoles designed to maintain traction on wet surfaces. Even if you’ve already fitted yourself with a pair of the best men’s hiking shoes, there’s a good chance you should still consider adding some waterproof hikers to your travel gear arsenal. Being the adventurous traveller you are, there’s a number of situations where some weatherproof footwear will come in handy—from misty mountain hiking in the Pacific Northwest to cooler wet spring & fall days in Central Europe. That’s not to say they’ll be ideal in every situation. With weatherproof hiking shoes, there’s a trade-off between sealing out wetness and sealing in the sweat. Most of these kicks run far warmer than your average shoe, and are not suitable for mid-summer hikes or other excursions in warmer weather. Weight: 1 lb. 0.5 oz. A weatherproof version of one of the most popular hiking shoes in history, the Merrell Men’s Moab 2 Waterproof traverses through any terrain that’s thrown at it. This legendary pick is one of the most versatile of the bunch, shaking out a surprisingly breathable (though not necessarily breezy) design. The secret sauce is in the M Select DRY membrane complementing a suede leather and mesh upper. It’s designed to seal out moisture while allowing sweat vapours to escape, keeping you dry inside and out. For support, the Merrell Men’s Moab 2 Waterproof stands upon a M Select FIT.ECO+ footbed and molded nylon shank. Powering over hard & uneven terrains is no problem for the Moab 2. Not only will the comfortable EVA midsole and air heel cushion absorb much of the shock, the Vibram TC5 Outsole, fitted with 5mm lugs, keeps you steady on your feet in a variety of conditions. The excellent support of the Merrell Men’s Moab 2 Waterproof seems to come at the expense of its weight. This is one of the heavier picks of the bunch and may feel clunky and stiff to some wearers. Hikers with wider feet may also want to look elsewhere as the Moab 2 design’s a bit narrower than its predecessor. For hammering through demanding hikes, look no further than the Salomon Men’s XA Pro 3D GTX. Designed with the needs of trail runners in mind, this high-performance waterproof shoe protects with a Gore-Tex lining that keeps your feet dry even when Mother Nature’s got some nasty plans in the works. The cutting-edge Gore-Tex membrane strides above its competitors by providing better-than-average breathability on top of its blue-chip moisture-sealing. It’s lightweight, too, making it among the most packable picks for travellers. On the trails, the Salomon Men’s XA Pro 3D GTX really shines by hoisting up a ton of support throughout the entire shoe. An 3D Advanced Chassis combines forces with an EnergyCell injected EVA midsole to create a stable & comfortable fit that doesn’t compromise movement. The high-traction Contragrip outsole, fitted with powerful lugs, propels you over wet surfaces without worry. Since the Salomon Men’s XA Pro 3D GTX is designed for stability and performance above all else, some hikers may find these shoes a little stiffer, slightly narrower, and tougher to break in than others. 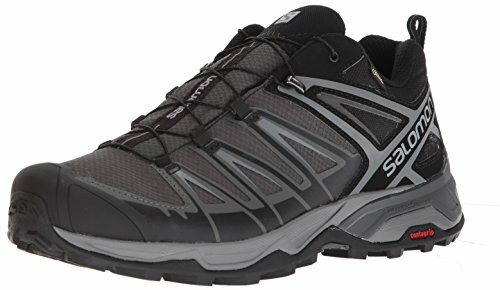 An update on one of the best-selling waterproof hiking shoes of all time, the Salomon Men’s X Ultra 3 GTX offers some of the best performance for hikers on the market with advanced features that make tackling even the toughest trails seem like a walk in the park. At the heart of these kicks is Salomon’s own Advanced Chassis. Set in line with an injected EVA midsole and foam cushioning, this support system keeps your heel in place while stabilizing for carrying heavier loads such as when you’re trudging along with a big backpack. With its built-in Descent Control technology, the X Ultra 3 GTX proves especially effective on downhill treks. Of course, the waterproofing of the Salomon Men’s X Ultra 3 GTX also takes top marks. The upper features an advanced Gore-Tex Performance Comfort membrane that’s more breathable that your average weatherproof shoe. On slick wet surfaces, the ultra-aggressive lug pattern of the Contragrip outsole spurs you forward without fear of slippage. Like many of Salomon’s latest shoe updates, the biggest complaint from wearers is that the upper and the toebox on the X Ultra 3 GTX is too narrow. If you’re looking for reliable waterproofing without breaking the bank, the Columbia Men’s Redmond WP is one of the top contenders in its lower price range. Sporting Columbia’s own fully seam-sealed Omni-Tech membrane, these kicks keep the moisture out admirably without causing excessive foot sweat. Built with suede leather and mesh, the upper on Columbia Men’s Redmond WP is durable enough to plow through the most rugged trails you can throw at it. The proprietary Techlite midsole absorbs shock and adds a spring to your step to stop foot fatigue in its tracks. Topped with a non-marking Omni-Grip outsole, even uneven wet terrain is no match for the Redmond WP. Although the Columbia Men’s Redmond WP is easy on the wallet, it’s not one of the most robustly manufactured of our picks. The toecap glue & stitching appears to be a weak point, likely due to the toebox being tighter on some feet than other hikers. Among the most stylish of our recommendations, the adidas outdoor Men’s Ax2 CP ditches the classic trekker look for a sportier vibe that appeals more to urban trail runners than outdoorsmen. Don’t let their city-slicker façade fool you though: These top men’s waterproof hiking shoes are serious performers, unleashing a trifecta of water-resistance, comfort, and traction that’s to be reckoned with. The waterproofing in the adidas outdoor Men’s Ax2 CP comes courtesy of the company’s own Climaproof membrane technology. It’s full seam-sealed and breathable to keep your feet simultaneously dry and relatively cool—at least for a waterproof hiking shoe. In the midsole, a lightweight EVA is paired in the adidas outdoor Men’s Ax2 CP with an adiPRENE inset to step up the comfort along the most jarring of terrain. As you propel through your hike or your trail run, the Traxion outsole provides multi-directional grip over uneven & slick surfaces. If there’s any drawback of the adidas outdoor Men’s Ax2 CP it’s the stiffness of the build. 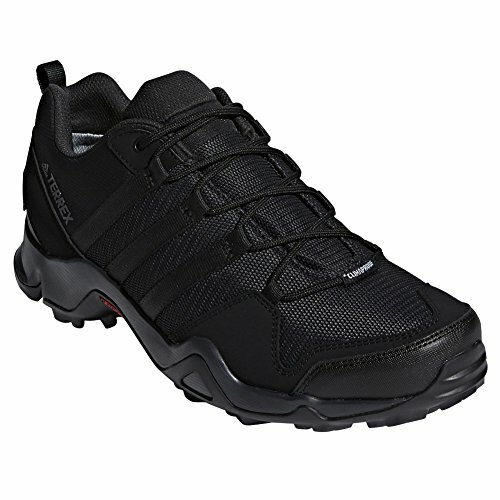 Designed for tougher terrain, this shoe is more comfortable along rugged trails than flat even surfaces. 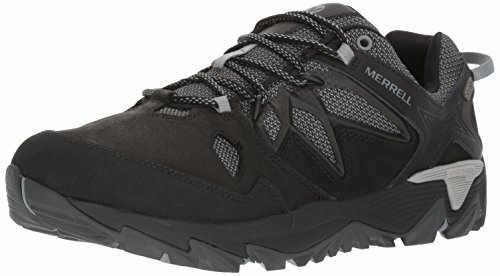 Among the best choices for epic wilderness adventures, the Merrell Men’s All Out Blaze 2 Waterproof tosses in all the features you need from a shoe that’s about to hit the dirt hard. With the M Select DRY waterproof membrane at the forefront, this hiker’s always ready to battle the vicious vagaries of Mother Nature right out of the box. Constructed with a premium full-grain leather and mesh combo, the upper is among the robust of our picks, willing to sacrifice itself to the most rugged of trails with few battle scars to show for it. This durability, of course, comes at the expense of its weight and breathability. 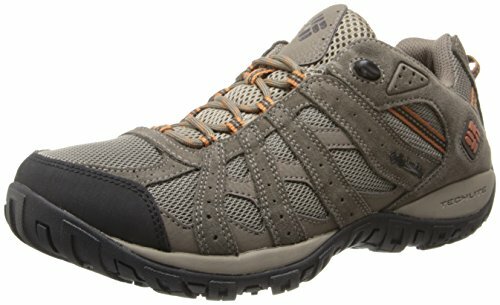 At over a pound, it slides in as the heaviest pick among these top men’s waterproof hiking shoes. 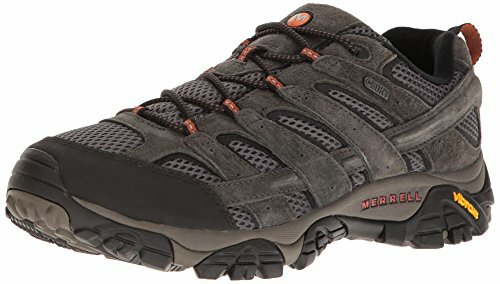 Aside from its sturdy construction, the Merrell Men’s All Out Blaze 2 Waterproof is an all-out comfort fest for weary feet. The midsole drops in a FIT.ECO contoured EVA footbed alongside Merrell’s own Air Cushion Viz, featuring an EVA heel pod to maximize shock absorption, add stability, and spring your steps forward. Meanwhile, the beefy Vibram TC5+ outsole snaps easily to slippery terrain thanks to its 4.5-mm lugs. While these waterproof hiking shoes might not make you as “supersonic” as the celebrated pre-millennial video game character hidden its name, The North Face Men’s Hedgehog Fastpack GTX pride themselves on their speed—from their lightweight construction to their stability on uneven terrains. Starting with its weatherproofing, The North Face Men’s Hedgehog Fastpack GTX features a Gore-Tex lining that protects from wet conditions without leaving your feet a sweaty mess. The upper fuses PU-coated leather with mesh for extreme durability and extra breathability. Trail runners and hikers alike will love TNF’s own Cradle Guide midsole, designed with an EVA footbed and TPU shank to keep the foot centred and supremely cushioned. Along slippery surfaces, The North Face Men’s Hedgehog Fastpack GTX grips down hard thanks to its Vibram outsole. Like many of the best waterproof hiking shoes for men, the biggest gripe about The North Face Men’s Hedgehog Fastpack GTX is its stiff construction. Even with extended wear, the outsole doesn’t seem to soften up, which can be good or bad depending on how you’re looking to use the shoe. 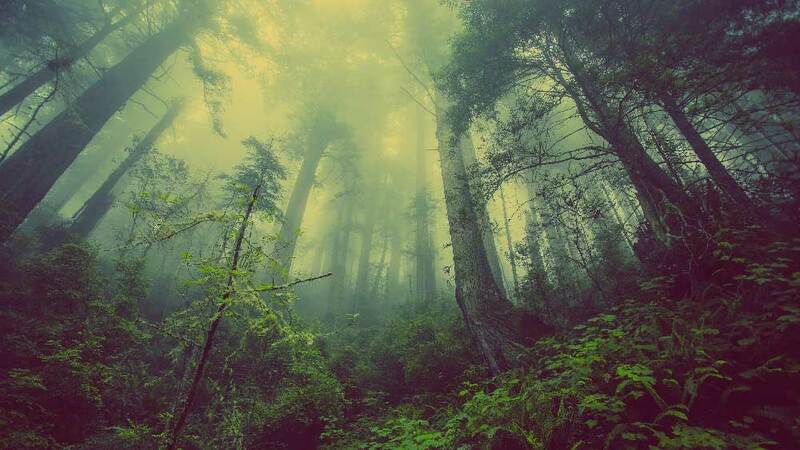 Ready to hit the trail running? 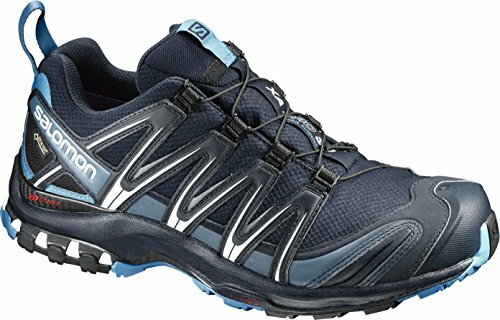 The tremendous stability and comfort of the Salomon Men’s XA Pro 3D GTX is perfect for taking your hikes up a notch. Need a waterproof hiker without the bulk? The awesome Salomon Men’s X Ultra 3 GTX is not only one of the lightest picks among our recommendations, but one of the best overall for its superb support and comfort. Looking for a solid all-around pick? 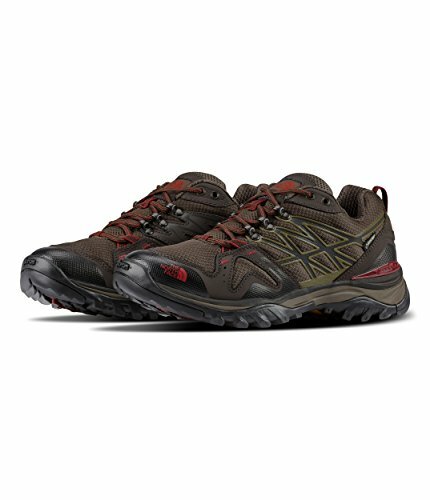 Although it’s a tad on the heavy side, you can’t go wrong with the build-quality and comfort of the Merrell Men’s Moab 2 Waterproof or Merrell Men’s All Out Blaze 2 Waterproof.